I was talking to my best friend this morning about another miracle story with a severely injured cat I just rescued about 4 days ago with a miraculous recovery using one of my products. I kind of panicked when I found her as her paws (top and bottoms were a complete mess) were seeping large amounts of pus & very bloody – and completely torn apart – this was serious. She was very sweet to let me pick her up – get her to an outside sink, where I poured the Honey Scrub Face Wash all over her paws, as I knew it would kill bacteria and infection on impact. After drying her paws off gently, I took pure Castor Oil and poured on the entire area, set her in a kennel and repeated the process 2 more times that day -and the next morning there was a huge difference. It’s been about 4 days and with daily treatments she is almost completely healed. I was unable to put regular litter in the crate due to worrying about infection – but am using Good Mews Paper Pellet cat litter. Its’ great to use after a neuter or spay. This is definately a must have if you are camping or in a place where you have no access to medical help – in case you have a wound or injury. If you have a pimple or boil just apply a dab and let dry like a liquid band-aid. 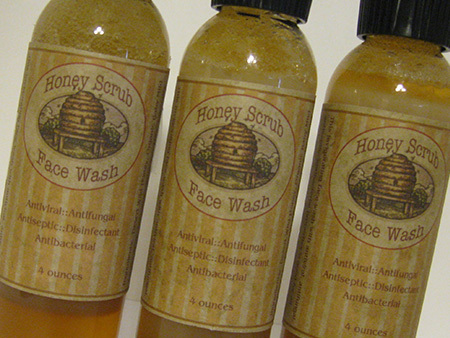 I’ve talked about this face wash before, but even over using for beautiful skin and skin ailments – it is out of this world for wound healing in humans and animals. I had a severe hand injury from a dog attack years ago and without insurance this is the only product I used for a month and healed my hand, although I did loose some mobility in the hand. 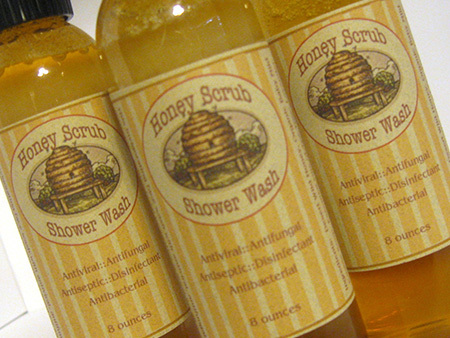 It is in every room in my house that has running water and in summer I use the Honey Scrub Shower Wash daily.